Heat oven to 400°F. Place pie crust in 9-inch glass pie plate as directed on box for One-Crust Filled Pie. Bake crust 12 to 14 minutes or until golden brown. Cool completely, about 30 minutes. Spoon contents of can of dulce de leche into center of cooled crust; gently spread to edge. 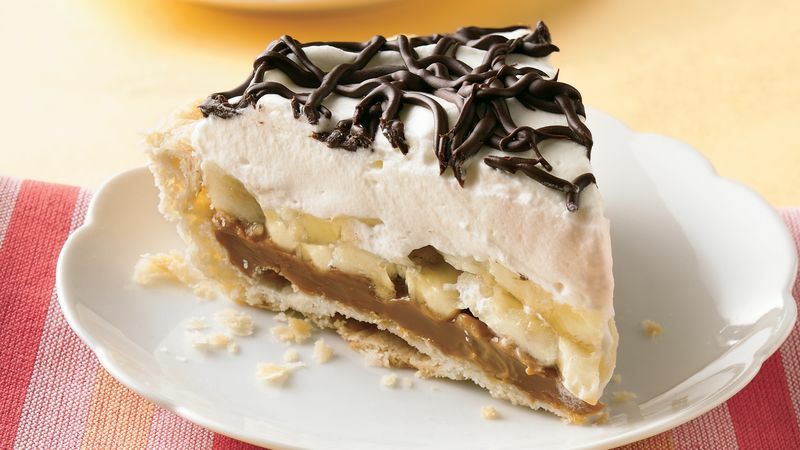 Thinly slice bananas; arrange over dulce de leche. In medium bowl, beat whipping cream and powdered sugar with electric mixer on high speed until stiff peaks form. Spread over bananas. In small resealable freezer plastic bag, place chocolate chips and oil; seal bag. Microwave on High 30 seconds; knead bag to mix melted chips and unmelted chips. Microwave 15 to 30 seconds longer or until all chips are melted and smooth. Snip off tiny corner of bag. Pipe melted chocolate mixture over whipped cream. Store pie in refrigerator. Dulce de leche is a traditional Spanish confection made from milk. It's a popular culinary reference to rich caramel flavors. Look for canned dulce de leche in the Hispanic section of the supermarket.